“We can't thank you enough for the wonderful experience our son had in the Early Stages workshop. He thoroughly enjoyed it and, WOW, what a thrill it was for our family to see him up on that stage. Every interaction we had with you and everyone there was impeccably professional and warm. 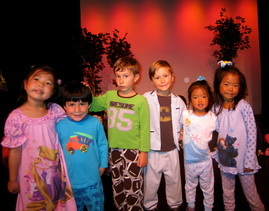 Most of all, our son had a blast and wants to do it again!” Susan N.
A workshop for ages 4 to 6 year olds focusing on the joys of creativity, self-expression and imagination through the use of theatre. Sing songs, play games, bring favorite fairytales to life, and perform on stage with company members of the Summer, Fall or Spring Theatre "big kids" Workshops. Focus is on sharing, caring, and having a fun time! Perfect for the energetic, dramatic, artsy youngster! A great way to introduce the arts at a very early age. Partial Scholarships and Sibling Discounts may be available - please ask us for details!